Designer Falk Wolsky’s wife was helping their son with his homework when she realized he was making mistakes without her noticing. She casually mentioned the need for a pen that would alert you to spelling and penmanship mistakes. Like any good dad, Wolsky took notice. 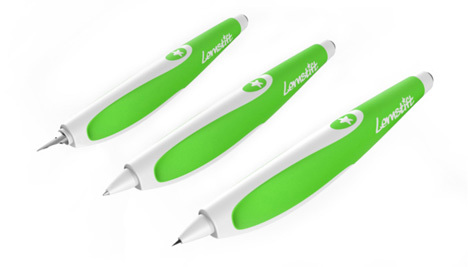 Along with fellow designer Daniel Kaesmacher, he created the Lernstift (German for “learning pen”). While the user is writing, it releases a gentle vibration to tell the user that they have made a spelling mistake, or to correct their handwriting. The writing utensil has three interchangeable tips: pencil, fountain pen, and ballpoint. Although it’s designed for children, the Lernstift packs a tiny computer inside its ergonomic design. An embedded Linux system runs the board, which contains a motion sensor, processor, memory, vibration module and Wi-Fi module. It has two modes: Orthography mode, which recognizes spelling mistakes; and Calligraphy mode, which recognizes flaws in legibility. Eventually the designers hope it will contain the capacity to help people learn new languages through writing. See more in Home & Personal or under Gadgets. July, 2013.